Product prices and availability are accurate as of 2019-04-23 17:26:10 UTC and are subject to change. Any price and availability information displayed on http://www.amazon.com/ at the time of purchase will apply to the purchase of this product. 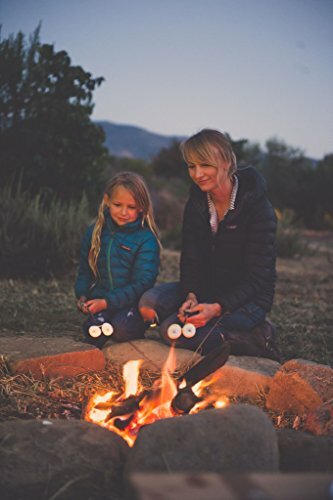 "Want Sturdy, Portable, Quality Campfire Skewers So You Can Enjoy Roasting By The Fire, Without Settling For Dirty Twigs Or Cheap Wooden Sticks? Don't Be Fooled By Copycats...Get The Real Thing Here!" Ready to end the frustration of low quality, hard to use skewers that don't roast well? 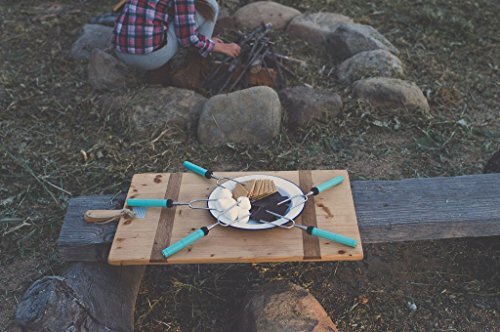 Want clean and delicious smores in just seconds? Like the idea of having a durable, portable roasting set that won't easily break? It's time to get this so you can see what you've been missing. Nothing else (online or in a store) compares. Lifetime warranty makes this a no-brainer! Why wait another second? You should enjoy eating by the fire without hassle or getting sick, that's why we made this. The smirk on your face when you watch your family enjoy these is worth far more than the price you're paying; you know this. Even if you've tried other products or solutions, you NEED to try this! PLEASE STOP AND READ THIS BEFORE BUYING ONLINE OR FROM A STORE... Most sellers/stores don't want you knowing that cheap fire pit skewers don't last, while the expensive 'name brand' ones are no better in quality than ours. Plus, neither have a lifetime warranty like ours (for good reason). 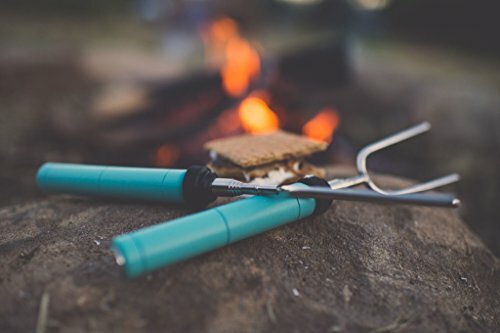 --- Click [Add to Cart] --- to easily cook hot dogs, smores, kabobs and more, not risk it with dirty twigs...AND avoid the cheap imitators that don't work and leave you hanging...a real win-win! Note from the manufacturer: Demand has spiked as our marshmallow roasting kit continues to spread on social media. Order before they're gone. We're doing our best to keep our product in stock. FASTEST MOST EVEN ROASTING! LOVE THIS SMORES KIT OR WE'LL SEND YOUR MONEY BACK! -Want to make perfect smores fast? No more dirty twigs or bamboo skewers that break! Our portable roasting forks are perfect. Super sturdy, safe for kids around campfires | Very limited supply. THE ONLY HEAVY DUTY STAINLESS STEEL FULLY ADJUSTABLE ROTATING FIRE PIT SKEWERS WITH A LIFETIME WARRANTY! 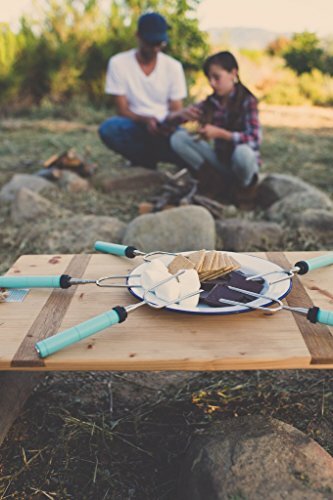 -For the cost of dinner the last retractable smores sticks you'll buy. Isn't that worth it alone? Real stainless steel skewer with wood handle heat resistant bag! NOTE: WE HAVE UPDATED THE ZIPPER 9/10/2016! 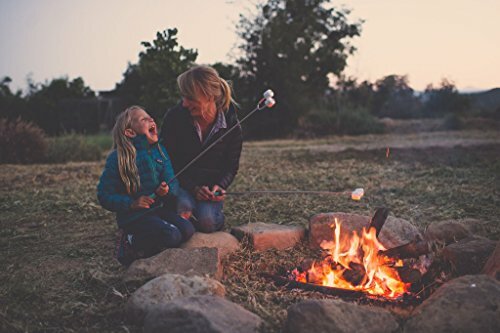 [EASY ROASTING] PERFECT FOR CAMPFIRE, SMORES, HOT DOGS & MORE! NOTHING ELSE COMPARES -Don't price shop; imitators break, don't cook thoroughly, nor are easy to carry & use like ours. You'll wish you found them months ago. Extendable from 10"-34". 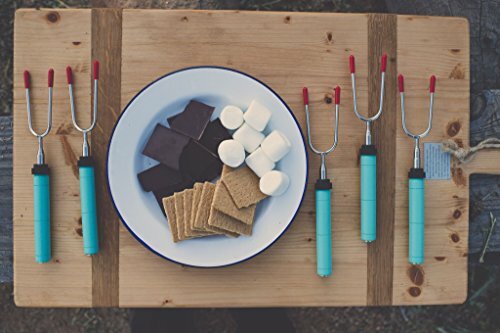 READ BEFORE BUYING...OTHER SELLERS DON'T WANT YOU KNOWING THIS --> Other campfire cooking skewers look great in the picture, yet break easily, are small & flimsy, plus have no warranty (for a reason) like ours if they don't work. Nothing comes close. HURRY FOR THESE PRIVATE AMAZON BONUSES -Lifetime Warranty comes FREE, $16.63 value. [BUY 2 GET 1 FREE, code below] Get a few or give as gifts. Haven't you waited long enough? Imagine the memories you'll make with these. This investment makes sense.